As the U.S. Department of Education proposes weakening the Gainful Employment (GE) rules regulating for-profit and vocational education programs, accurate estimates of the earnings outcomes and debt incurred by students in these programs are essential for judging the merits of various policy options. In a forthcoming paper for the Journal of Human Resources, co-authored with Federal Reserve Board of Governors Senior Economist Nicholas Turner, we generate comprehensive new estimates of labor market outcomes and debt incurred by students in vocational (or career-technical education, “CTE”) certificate programs in the for-profit sector. We compare for-profit students’ outcomes to the outcomes of similar students in similar public sector certificate programs. We further compare the employment and earnings of for-profit students to demographically similar individuals who do not pursue any postsecondary education. Our results are striking: Public sector students outperform for-profit students on nearly every measure, suggesting that the overwhelming majority of for-profit students would be better off attending a public institution. But what if attending a public community college is not an option? Our results suggest that many for-profit students would be better off not attending college at all. On average, for-profit certificate students do not generate enough earnings gains to offset the debt they incur. To carry out our estimation, we draw on the Department of Education’s GE data matched with tax records from the Internal Revenue Service. Our data include roughly 14 years of earnings history for more than 800,000 federally aided certificate students, allowing us to assess the labor market outcomes of a more comprehensive set of students over a longer time period than prior research. Our analyses focus on students attending for-profit institutions. These institutions often specialize in vocational certificate programs; despite enrolling just 8 percent of postsecondary students, they confer nearly one-third of all short-term certificates. We generate a comparison group of students in public sector certificate programs and compare the before-versus-after earnings of each group. Importantly, we implement a careful matching strategy to construct our comparison group, and control for differences in student demographics (such as age, gender, number of dependents) as well as prior employment and earnings across sectors. For example, we consider women in their 30s in Washington, D.C., health administration programs. Within this group, we then compare the individuals that are most closely matched on prior earnings and demographics, but who differ in their enrollment—one attending a for-profit program and the other a public program. Our strategy improves on previous studies of post-college earnings, where differences in student characteristics may drive differences in student outcomes and mask differences in college quality. We find that the earnings gains of for-profit students are substantially lower than the gains for similar students in the public sector. For-profit students are 1.5 percentage points less likely to be employed after leaving their program; if they do find work, their earnings are about 11 percent lower than those of public students. Putting these effects together, on average, earnings gains are $2,100 lower per year post-college for for-profit students, relative to their matched public sector counterparts. This finding is particularly concerning given the much higher debt incurred by for-profit students—about $5,000 more in our sample. To put these results in perspective, on average, for-profit certificate students earned just over $10,000 in the years prior to attendance. Click on the figure to open a full-size version in a new window. Even more striking, we find that for-profit students have lower earnings gains and larger levels of debt across most programs of study (defined by 4-digit Classification of Instructional Program level). Table 1 shows results for the 20 most-popular programs in the for-profit sector. In this table, just four fields (cosmetology, vehicle maintenance, ground transportation, and nursing services) have higher earnings changes in the for-profit sector. However, even among this set of programs the gains—at most $558 per year—are offset by higher debt of about $3,000. The other 16 fields reveal lower earnings gains combined with debt that is at least $3,000 higher. Estimates based on analysis presented in Cellini and Turner (2018). Our results suggest that most certificate students would be better off in public institutions. However, a separate question is whether students attending for-profit institutions would be better off attending no college at all. We investigate this question by matching for-profit students to similar individuals with no college education. We find that the earnings gains to attendance cannot be shown to be different from zero and are, at most, about $365 per year. 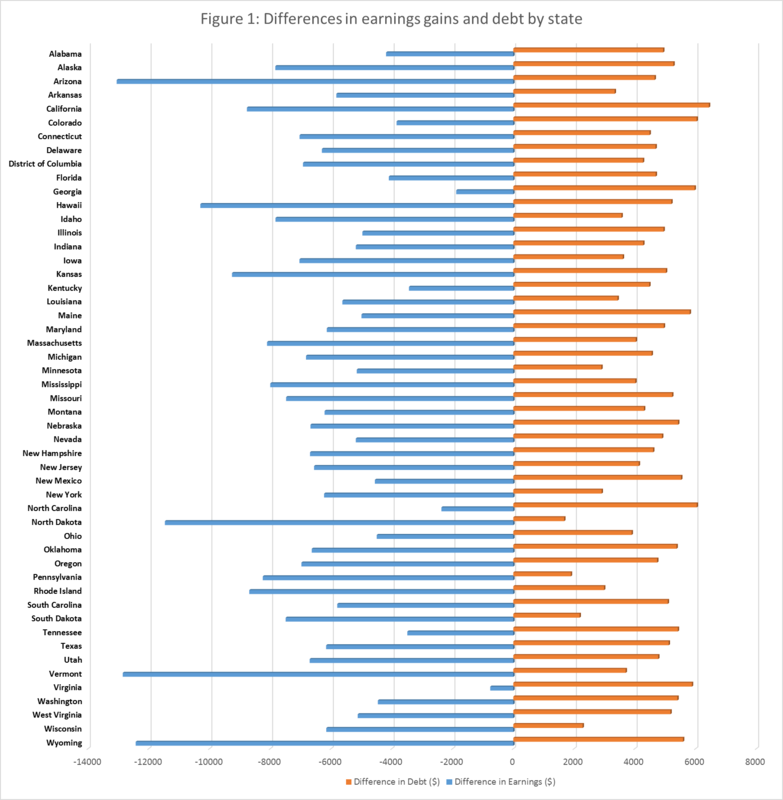 Comparing these best-case average earnings gains to average debt in a back-of-the-envelope calculation suggests that—even in the best case—the increased earnings of for-profit certificate students are not enough to offset their debt and interest payments, leaving the average student with a net loss of about $1,200 over her lifetime. Our results may help explain the findings of other research documenting high student loan default rates among for-profit students. They also suggest that the Department of Education’s recent proposals to weaken accountability under GE are misguided. Rather than removing sanctions for institutions whose graduates have high debt and low earnings—as the DeVos administration proposes—our results support calls for stronger accountability measures to ensure that for-profit students generate sufficient earnings to cover the high cost of their education.